During the 1930s, the Deutsche Institut für Normung (German Standards Institute), abbreviated to DIN, recognised the need for a more practical colour system than the Ostwald system, which had been in use since the First World War. It was for Manfred Richter, a member of the staff at the Bundesanstalt für Materialprüfung, to realise this task. Richter was requested to proceed on a scientific basis with the aim of creating a new system which was capable of standardisation. It was not until 1953, however, that Richter and his workers were finally able to submit their results. The first question to be resolved concerned suitable colour-coordinates. The objective was to fulfil Ostwald’s original requirement — which, incidentally, he himself failed to do — as effectively as possible, and base the new system on a series of variables perceived by an observer as being visually equidistant. In order to divide up the full colour-circle into steps of equal size, extensive experiments were carried out using many hundreds of test subjects working with more that a hundred colour-hues. Colour-coordinates were derived from 24 points which defined the «equidistant» hues, and numbering commenced with 1 at yellow, proceeding via red (7), blue (16) and green (22) before returning to yellow. The next step was to arrange colours of the same saturation and brightness within a given circle. The DIN system still operates today using three variables: DIN colour-hue (T), DIN saturation (S) and DIN darkness (D). They provide the coordinates for the three dimensional system of non-self-luminating colours shown opposite. This diagram uses the visible half-plane to display surfaces of constant T-value. Surfaces of the same S-value are represented by the cone, and surfaces of the same D-value are shown by means of the sphere. Within the DIN system, the intersection of these three surfaces determines a colour. The first diagram shows the three-dimensional system which makes possible the DIN colour-chart; a second diagram shows a representative surface of equal colour-hue. 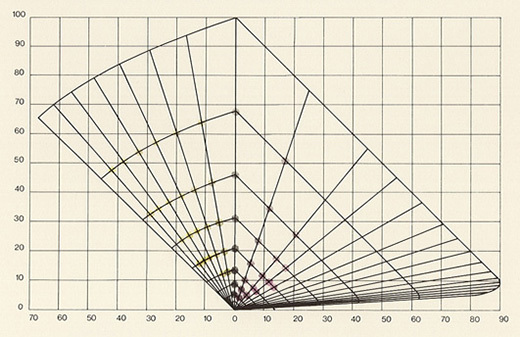 The darkness scale runs from above downwards — the numbers on the axes either defining the reflection of light or the brightness — while the saturation values are given on the horizontal axis. The darkness gradation applicable to all colour-series is based on a baffling formula for the grey series, defined in such a way that ideal black is assigned the darkness gradation 10 and ideal white (and all optimal colours) 0. It is mainly this parameter which distinguishes the DIN colour-system from the Munsell system, and enables the DIN system to associate colours not of the same brightness but of the same relative brightness. In terms of perception, this is more appropriate, since we tend to sense colours of differing colour-hue as being of equal value. A DIN colour-hue is defined (at a given level of saturation and darkness) by means of a colour-circle with 24 gradations which has been established by means of the selection process previously described. 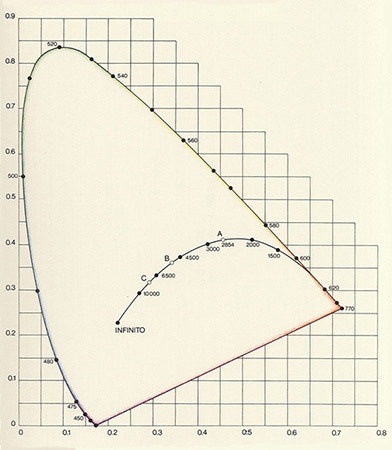 Here, we can see that colours of the same hue are characterised by a so-called dominant wavelength, which can also be found in the CIE diagram by drawing a straight line from the so-called achromatic point of the standard light source ‘C’ through the colour and then noting the point of intersection with the surrounding tongue-shaped curve. The way in which the DIN system determines not only the colour-hue but also saturation is in principle no different than any other. With the DIN colour-circle, saturation gradations commence with S = 6 and end at an achromatic point S = 0, and both colour-hue and saturation together form the colour-type. As already mentioned, the DIN system achieves special status by means of its darkness scale, which can be regarded as the measure of the relative brightness of non-self-illuminating colours. The introduction of this, in detail very complex, measurement is intended to provide psychological balance to the DIN colour-circle, also with regard to brightness. This does not necessitate a sensation of equal brightness for all colours in the colour-circle, but merely a visual impression that they belong together. 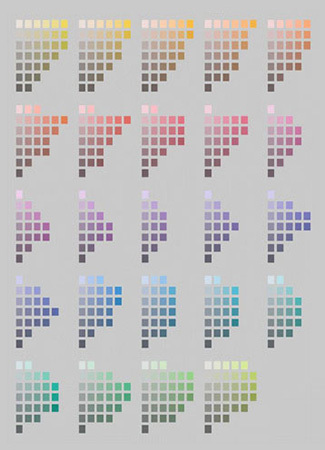 The inclusion of samples was always planned for the DIN system, and a satisfactory version of 600 colour samples was produced between 1961 and 1962 — the DIN Colour Chart 6164. It comprises small colour rectangles of 20 x 28 mm, the colours of which are identified by a three-figure digit in the sequence T:S:D. A green, therefore, may be identified as 22,5 : 3,2 : 1,7. The DIN system presented here is the only system to fulfil the four requirements which its creator, Manfred Richter, demanded as a basic principle of all colour systems. 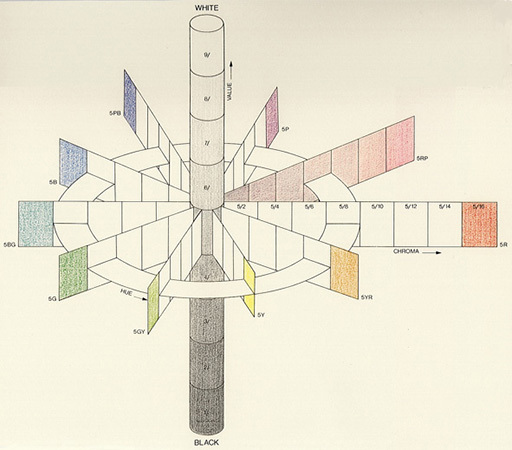 They stem from the observation that no system can be based on colour sensations because each colour-atlas must depend on colour samples which represent particular colour-valencies. 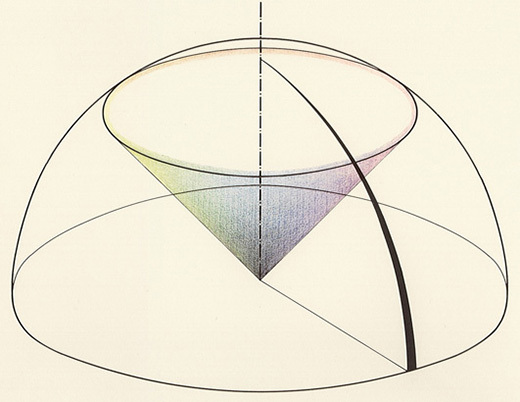 Richter states in his Introduction to Colorimetry: «First and foremost, any system using a colour-atlas should be based exclusively on colour-valency, and not on pigments and dies. Secondly, the selected colours should be numerically exactly defined … thirdly, the colours should be selected so that, displayed in a non-empirical system, they will result in smooth curves and surfaces. Fourthly, a certain built-in tolerance of reasonable latitude should be both stipulated for all colour samples, and complied with.» This last point was also made because excessively narrow tolerances would send the price of sample manufacture skyrocketing. Beauty may have its price, but there must always be someone who can pay it. Date: The colour-system started development in 1941 on the initiative of the Deutschen Normenausschusses. Initial results have been available since 1953. Bibliography: M. Richter, «Untersuchungen zur Aufstellung eines empfindungsgemäß gleichabständigen Farbsystems», Zeitschrift für wissenschaftliche Photographie 45, pp. 139-162 (1950); M. Richter, «Der Farbkörper des DIN-Farbsystems», Die Farbe 2, p. 137 (1953); M. Richter, «Einführung in die Farbmetrik», Berlin 1976.